bzimport set Reference to bz51465. Removing the filtering comes at the expense of potentially exposing users to banners that don't work particularly well on small screens. 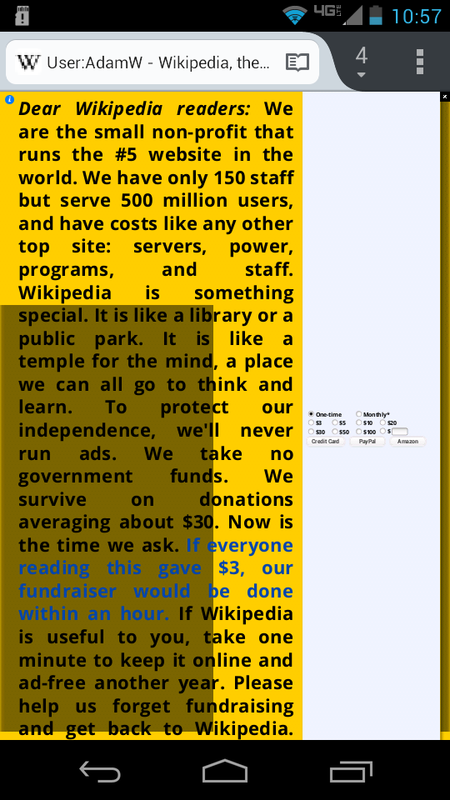 You want to show a banner on the desktop site (en.wikipedia.org and friends) when viewed in a mobile phone? Could you clarify "Removing the filtering comes at the expense of potentially exposing users to banners that don't work particularly well on small screens." - if a mobile views the desktop site on their phone they will either use a modified viewport  and the banner will look exactly the same as desktop, or if there is no viewport the entire website will be unreadable so I'd be surprised they'd even be in desktop mode. Does this effect the mobile site (en.m.wikipedia.org and friends) in anyway? I'm also unclear how this effects the VisualEditor roll out... (you mention this in the CentralNotice fix). The stopMobileRedirect cookie exists for a reason - if a user of the mobile site wants to see the desktop site this stops them from being redirected on every visit. We could only set the stopMobileRedirect cookie if the user is on a mobile phone but this is messy and I don't see what value the work put in to achieve this would gain. Does anything really need to change in MobileFrontend now? when viewed in a mobile phone? Nope -- we want to show a banner on the desktop site to a desktop user who has previously used the mobile interface. With CentralNotice not filtering; true mobile users who choose to use the desktop site may be presented with a banner that doesn't work on small screens - e.g. the buttons are too small to hit with a finger. this in the CentralNotice fix). Yep, understood. The feature request is more to not return 'desktop' devices to the desktop site after having viewed the mobile site with a stopMobileRedirect cookie. this would gain. Does anything really need to change in MobileFrontend now? Meh; don't know. This is an edge case... It's more related to if we have more things that are device dependent using the cookie to determine if someone is on a big device or not. e.g. the buttons are too small to hit with a finger." The banner will be exactly the same size for users viewing the desktop site on a mobile device. Adam got this whilst browsing on the desktop site on his phone whilst logged out. Does it disappear when you scroll? Is it fixed position or absolute? I'm marking this as wontfix. While I see your point about not setting the stopMobileRedirect cookie for devices that wouldn't normally get automatically redirected (eg a desktop browser), we don't have a reliable way to detect that, so without rearchitecting, we can't really achieve this. Ultimately, we've been attempting to simplify how MobileFrontend works - partly for performance/caching reasons and partly for codebase sanity, and I do not think this usecase is compelling enough to warrant additional complexity. I suspect Jon is right that with some CSS magic you may be able to resolve the specific issues you're running into with the banners. Otherwise, we should have a bigger discussion about how best for you guys to achieve what you need from within CentralNotice.